Anyone seen any ethical behavior recently? Manawatu Standard, July 6, 2012. Global warming worsens: All hands to the pump? Cartoon from the Manawatu Standard of July 4, 2012. Cartoon from the Manawatu Standard of June 29, 2012. The FBI’s bid to extradite Megaupload founder Kim Dotcom from New Zealand to the United States suffered a setback last month, when Justice Helen Winkelmann said the warrants used when more than 90 officers stormed Dotcom’s home and other properties in January were too broadly cast, “lacking adequate specificity as to the offence”. From the Manawatu Standard of June 23, 2012. From A Century of Punch, edited by R.E. Williams (William Heinemann Ltd, 1956). NEVADA TEST SITE, August 7, 1957: The tail or “after” section of a US Navy blimp is shown with the Stokes cloud in background. 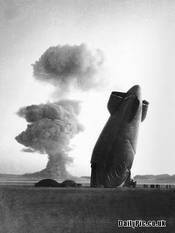 The unmanned, experimental blimp was in free flight more than five miles from ground zero when it was collapsed by the shock wave from the blast. On the ground to the left are the remains of the forward section.